This bit of research termed “the Aishwarya effect” helped us realise this much: that the media finally found something to push this Bollywood star and millions of Indian women under one set of statistics. So, it’s a “feat” of its own class in a country where more than half of all married women are anaemic and 1/3rd of them are malnourished (have a below-normal body index). It hits headlines in a country where only 47% of Indian women are likely to have an institutional delivery and where maternal mortality rate (212/1000,000) ranges from 81 in Kerala to 390 in Assam. And yet, crores of unsung anaemic women who escape such statistics somehow manage to pop their little ones out in back-of-beyond villages where a primary healthcare centre is a luxury. If their little ones also survive, then it’s a miracle in itself because every sixth death in India pertains to an infant. Why do these horrid tales fail to hog headlines as often as they should, let alone attract serious and persistent debates, especially in the electronic media? Selective amnesia runs deeper among a majority of mediapersons. They often forget that no matter how they couch such news reports in ‘development’ rubric, it only amounts to vicarious thrills and parasitic existence living off of celebrity ‘feats’, gossip and scandals. That said, the ninth grandchild of the Bachchan family must be hailed for one thing. She becomes the most-celebrated and most-talked-about girl baby in a country where 7000 female foetuses are eliminated each day—irrespective of caste, region and economic status. Statistics: Unicef & Census India, 2011. 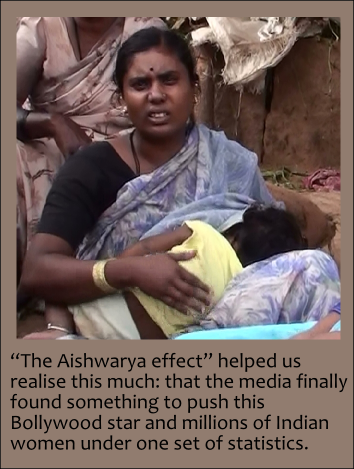 This entry was posted in Candid Comments, Media Charade, Women's Issues and tagged 'Aishwarya effect', Aishwarya Rai Bachchan, anaemic pregnant Indian women, Bollywood, Caesarean section, childbirth, Female foeticide, institutional delivery, malnourished Indian women, maternal/infant mortality rate. Bookmark the permalink. Well…as someone rightly said..Stop female foeticide else your son will become a gay very soon! Think people in India still haven’t got the message which is loud and clear.I sometimes wonder about what can be done to prove that its a woman you need right from lighting the fire in your kitchen to taking care of your’s and your childrens’ never ending demands and to warming your bed as and when you please. I certainly believe that there will be a day when the tables will turn because you can’t stretch a rubber band beyond its elasticity limit ! Hmmmm… I have nothing more to say!